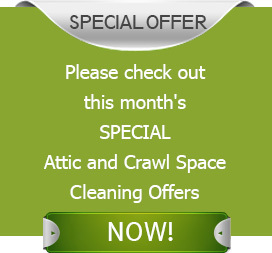 Attics and crawl spaces play an important role in the overall functionality of our homes. They insulate, slash energy costs, help retain a comfortable interior environment and ensure high indoor air quality. And yet, they are often forgotten. Homeowners are unaware of potential problems in those areas of the home until something goes wrong. Periodic inspections of attics and crawl spaces are essential in order to fix potential threats before they become issues. Once a problem occur, it would be much more costly to fix. Quartz Solutions can provide you that much needed peace of mind, and ensure that your attic and crawl space are safe and well-maintained. Since the dark, dreary environment of the attic and/or crawl space is generally un-monitored, they can create dangerous conditions that can have a negative impact on the health and well-being of the your family or residents. 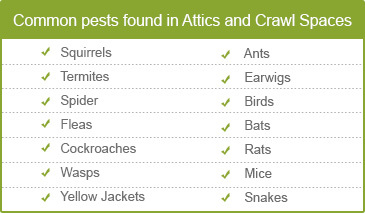 Animals like rodents, house mice and raccoons chew furnishings and electric wiring. They also leave behind filthy clutter that is unhealthy. Mold, mildew, and fungi can grow rapidly in spaces festered with excessive moisture. Apart from being a health concern, it causes wood decay, which can require costly repairs. Airborne spores can penetrate the living space and produce allergens and irritants, which may spark allergic reactions. Ants, termites, and various other pests cause structural damage which can weaken the very foundation of your precious property. Dripping ducts and damaged insulation can trigger a variety of negative repercussions in terms of higher energy costs and low efficiency. An attic and crawl space devoid-ed of infestations, damaged pipes and insulation, means a healthy and comfortable living environment. Hence, a careful inspection of the property is of paramount importance. Our certified professional team has the latest technologies to make sure that our inspection is as efficient as it can be. The team will also identify the critical areas around the property and formulate a cost effective plan to eradicate any existing problems. Unnecessary expenditure can put a dent in your budget. We, at Quartz Solutions, understand the worth of your hard earned money, hence we strive to provide the best cleaning solutions at the most competitive rates. Hoboken maybe a small town in Hudson County, NJ but it encompasses all the characteristics of a big city, complete with chic restaurants, cool bars, enticing parks, great malls and beautiful homes. Let Quartz Solutions make a small contribution to Hoboken’s mile-square size by keeping the attics and crawl space of the area in tip-top shape. We’ll take care of your home. Call us today at 201-205-2042 to avail a free inspection and consultation.